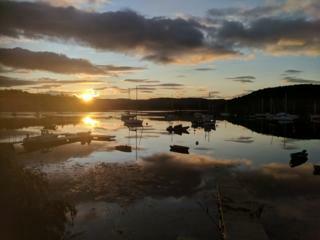 Image caption Sunrise at Tayvallich - captured on camera by holidaymaker Neil Gorst. 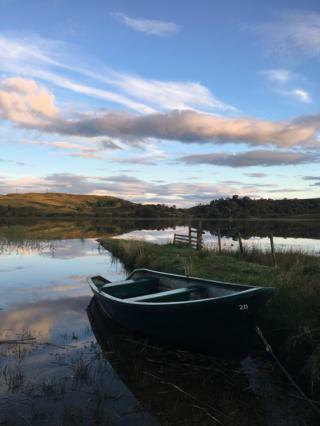 Image caption Johanna Gericke was also in Argyll and Bute. 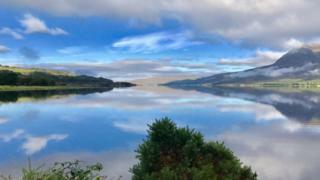 She saw the sun come up over Loch Tromlee and Ben Cruachan. 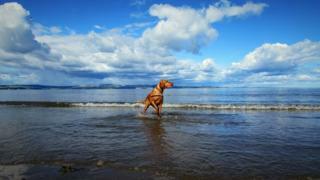 Image caption At Cramond beach, near Edinburgh, Isla the dog enjoyed a refreshing paddle. 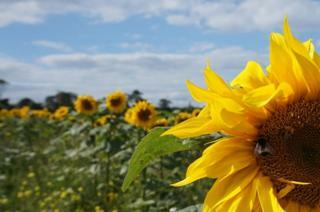 Image caption Ruth Jenkins spotted these sunflowers on the John Muir Way between Edinburgh and North Berwick - but she didn't see the bees until she was up close. 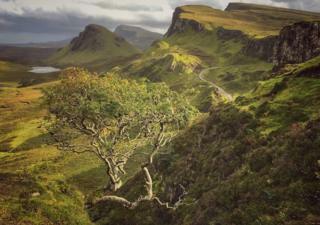 Image caption Jamie Burgoyne took this striking picture of the hills and glens during a short break to the Isle of Skye. 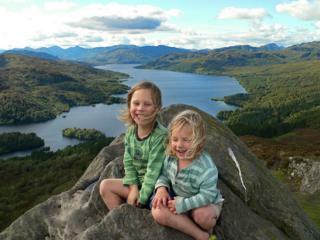 Image caption Jack, 4, and two-year-old Finn look delighted to be at the summit of Ben A'an in the Trossachs. Proud dad Stuart Wilson said they hiked up the hill themselves. Image caption Perhaps this photo most accurately represents this week's weather. 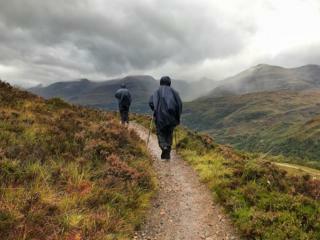 David Kent and his friends were heading towards Kinlochleven along the West Highland Way. 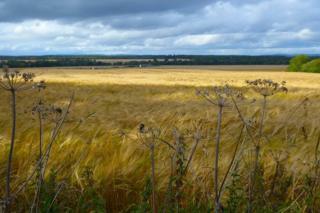 Image caption The sun was shining on this barley field in Nairnshire. 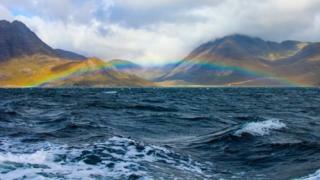 It was photographed by Alastair Macdonald this week. 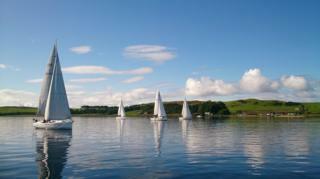 Image caption These yachts were taking part in the 16th annual Jeanneau Fun Race from Largs to Colintraive on Saturday. Unfortunately, the race was abandoned due to lack of wind. 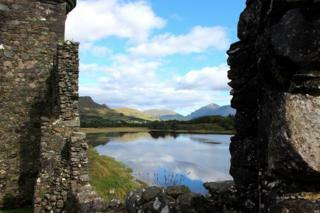 Image caption Scott Murray reckons Kilchurn Castle must be one of the most photographed in Scotland - so he decided to take this one from the inside, looking out. 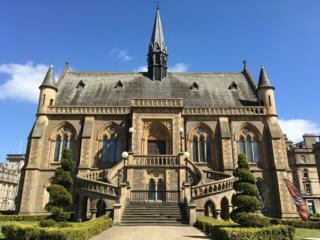 Image caption Lorna Milne sent us this picture of the McManus Galleries in Dundee as it is marking its 150th anniversary this week. Image caption A beautiful dog in front of a stunning view. 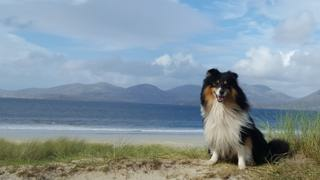 The picture was sent in by Anne Smith who was on holiday in Harris. 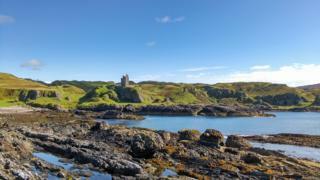 Image caption Neil and Marielle Mackenzie didn't want to leave the Isle of Kerrera after their day trip last Saturday. They nearly didn't - the ferry broke down on their way home. 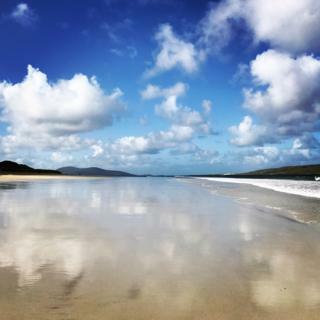 Image caption This picture of Luskentyre beach on Harris was sent in by Bruce Davidson. 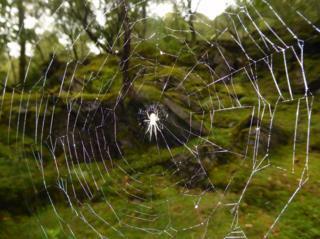 Image caption This giant spider's web looks like silk - it was photographed in Dorlin, Ardnamuchan, by Sara Boardman, from St Andrews. 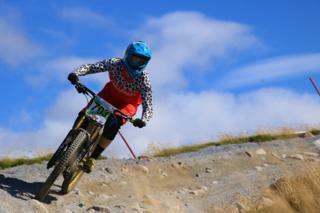 Image caption Local rider Fiona Beattie took part in the first day of the Scottish Downhill Mountain Bike Championships at Nevis Range. 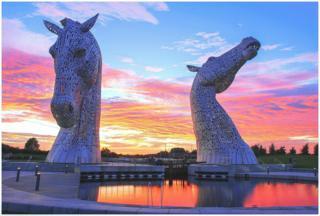 Image caption Sunset at the Kelpies and Frank McCafferty describes them as "fire horses". 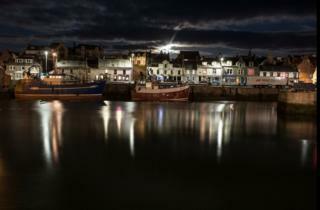 Image caption The streetlights were reflecting off the water as night fell in Macduff. Jimmy Thomson was behind the camera. 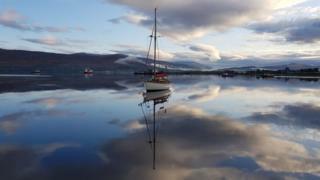 Image caption Graeme Purves came upon this sight on a very sunny and still morning on the water between Loch Eil and Loch Linnhe at Fort William, Lochaber. Image caption Emma Smith took this shot while on a fieldtrip with some geography pupils to Skye as they headed to Elgol. 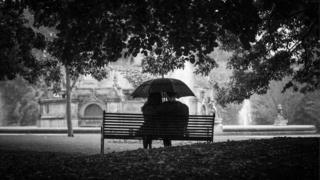 Image caption A downpour of biblical proportions didn't stop this couple from enjoying their coffee at Kelvingrove Park, says Jim McGinley from Uddingston. 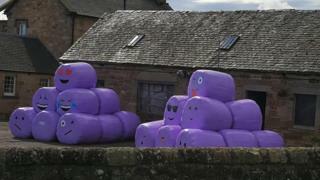 Image caption This display at a farm between Bo'ness and Linlithgow made Geraldine Walker from Inverness smile.